Before we left the apartment today I put together a Chocolate Cream Pie using the same basic custard recipe that I followed yesterday except in today’s batch I added about 4 ounces of chocolate. Later I tried making whipped cream with what I thought was whipping cream but eventually I figured out that it was closer to half and half (which will never hold a soft peak no matter how long you whip it!). So until I had whipping cream, I just let the pie set up in the fridge. 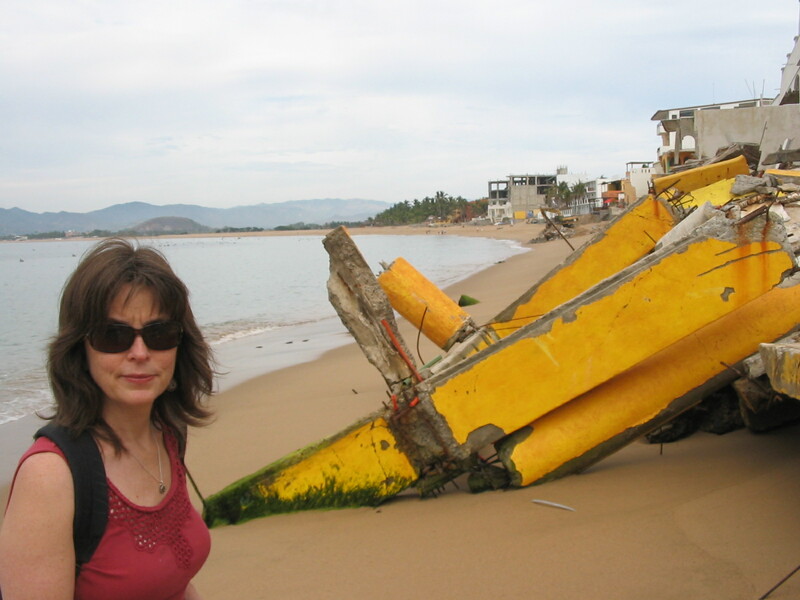 Then we took a walk along the beach of Barra de Navidad for the first time since we arrived. We had heard others mention that in the last week or so there had been an underground (under sea?) 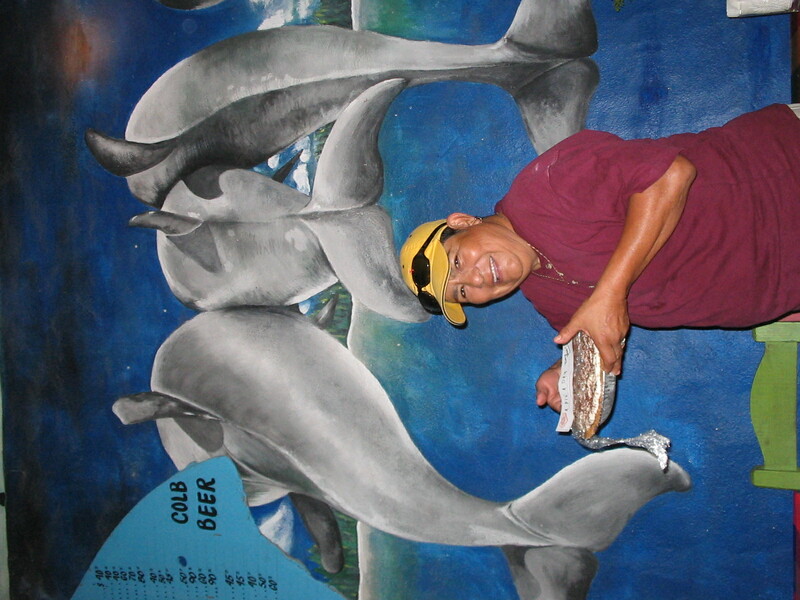 earthquake that released some toxic levels of gas which caused thousands of fish to die. 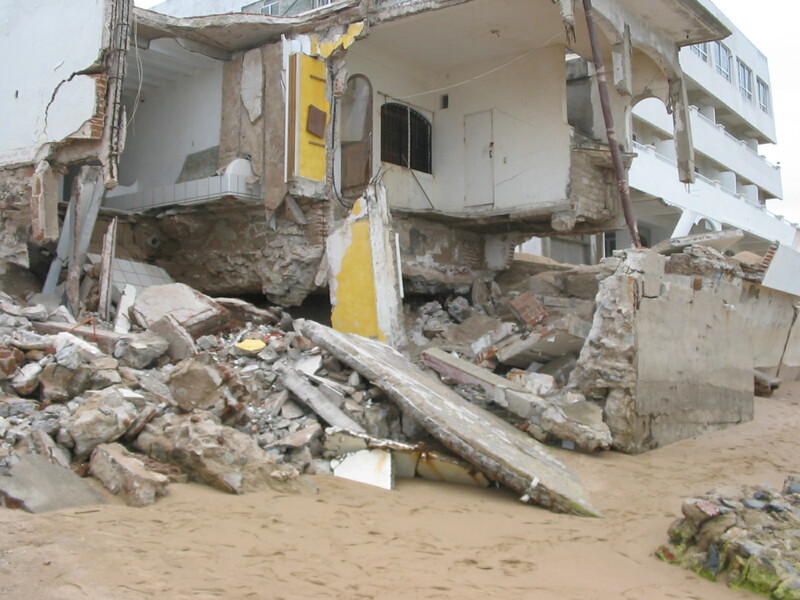 This disaster followed the hurricane that occurred last fall in Barra and caused quite a bit of damage to many of the buildings along the shoreline. 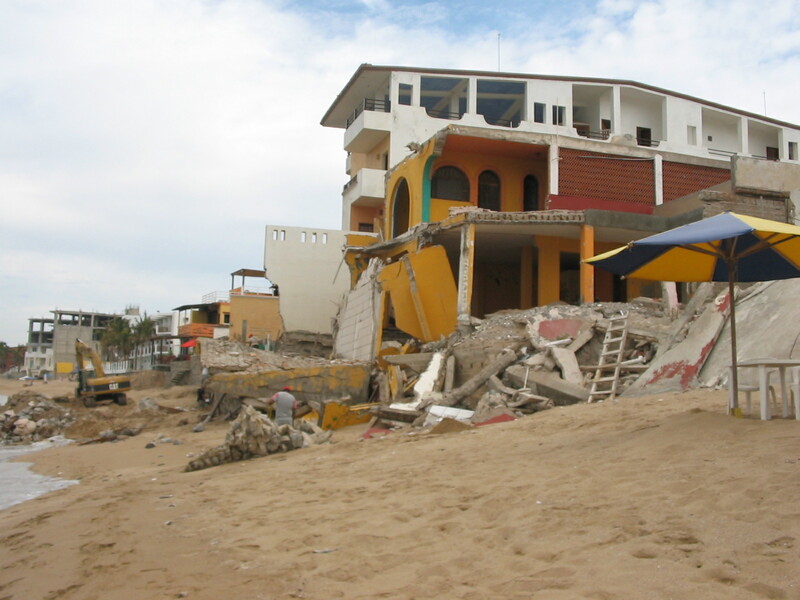 It is hard to understand why some regions experience so much devastation and others seem to go unscathed. And yet we did not see people complaining at all. Instead the waiters beckoned us to eat and the vendors set up their wares to sell and somehow the people just carry on as best they can. After our walk we found a grocer who sold whipping cream and once home I whipped it up and spread it atop the pie. Finally I found a chocolate bar and grated some of it for the garnish and then we were off to deliver the pie to Lucy. Lucy runs a restaurant in Barra named appropriately, Lucy’s. We first met her on our last visit to Barra. We were introduced to her by our friends Marie and Dale and have enjoyed several cold drinks and the occasional hot meal there. Lucy has a way of drawing people to her. She has had guests from around the globe and she has displayed flags from those countries on her wall. In addition, we saw she had posted hand-lettered welcome signs to returning visitors. It’s that kind of thing that keeps her guests coming back year after year – a warm welcome and the knowledge that they have been remembered. To recognize her for her warmth and hospitality, tonight I brought Lucy the Chocolate Cream Pie. There is no doubt in my mind that she will share it with her many friends. I’m loving your photos, Karen! What fun to bring your pie project to another country. Surely, the people who receive a pie from the American pie angel will have something to talk about for a long time! Debbie, I can see how it would be fun to gift pies to every corner of the globe… who doesn’t need to be appreciated? Thanks for helping me with your love and support! Your pies and the heart with which you give them are inspiring…..Lucy sounds like a lovely person- thanks for sharing about the area and its people- and their perseverance through hardship. The chocolate pie reminded me of one my Mom used to make when I was a teenager! Thanks Karen- enjoy the rest of your vacation! Thank you. Isn’t it funny that the memories we have about food are often connected to someone that we love? I made my first pie when I was about 11 or so. My Mom helped me and it was a cherry lattice topped pie. The filling was from a can, but I think we made the crust. It took a while to create the lattice and the pie looked beautiful when it was done. However, when I tried to take it out of the oven it got caught on the lip of the oven rack and flipped over… cherry pie all over the oven floor. While I don’t remember much after that (it was a long time ago), I do remember that my Mom had a “it’s not the end of the world” attitude… sort of saying “these things happen.” Thank goodness or I might have quit then and there! Thanks again for your comment. Can you believe the first pie I ever made in my teens was a lattice topped cherry pie too? Only I have to admit it looked pretty bad before I ever put it into the oven, but I did manage to get it out safely! Just last week my 15 year old daughter was pulling a hazelnut genoise cake out of the oven and it flopped over (she is an avid and accomplished baker for her age.) She went into hysterics while her Dad and I managed to get the cake back over and it was okay- the cake she created with it was for my oldest son’s birthday, and it came out beautifully. It was a moment to offer her the same kind of advice your Mom gave you- only I think I told her there should always be a plan B if plan A goes poorly! Great talking to you Karen! How strange that we had the same first pie! And thanks for being there to help your daughter through a baking crisis. And I suppose having a backup plan helps. I seem to remember an episode of The Donna Reed Show (definitely a sign of age!) and her daughter was in a home-ec class and had to prepare a dinner for the teacher. And there was some fiasco that took place and so the daughter “bought” a prepared meal for dinner. The teacher then came to dinner and oohed and aahed over it all and finally Donna’s daughter told her all about the purchased food. The teacher listened and then said that she was still going to do fine in the class because she had handled an emergency with aplomb. And while I don’t usually have a plan B in mind, when trouble strikes, I can usually come up with something. Thanks so much for writing.